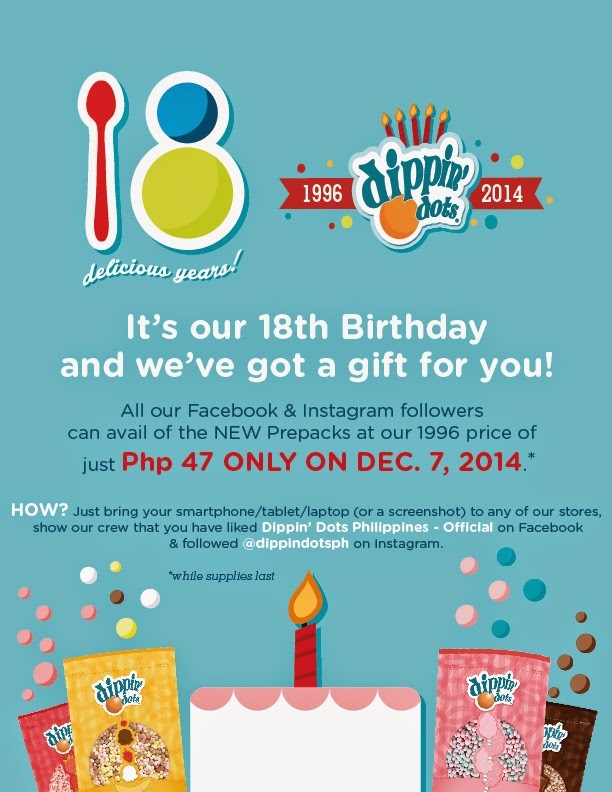 Dippin' Dots 18th Anniversary Promo! Dippin' Dots started operating its first store in Shangri-La mall on December 7, 1996. In celebration of its 18th birthday, all Facebook and Instagram followers can avail of the new prepacks at 1996 original price of just PhP 47, that's one day only so save the date on December 7, 2014! 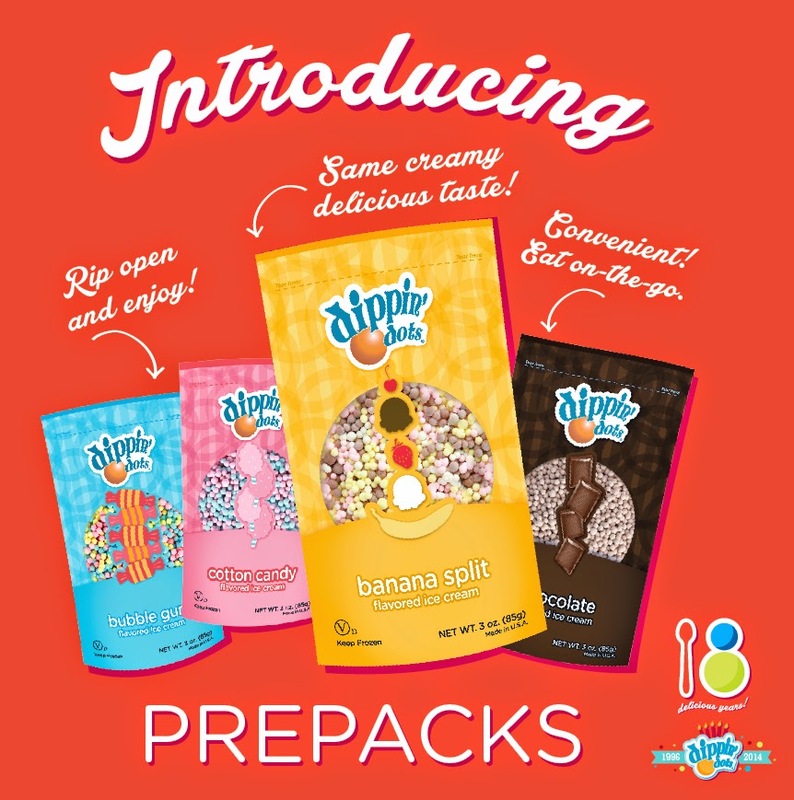 For people on-the-go but still love to eat ice cream, there's the new Dippin' Dots Prepacks. It's so easy and convenient, just rip open, eat and enjoy the same creamy delicious taste! Available for a limited time only starting on December 8, 2014 in Bubble Gum, Cotton Candy, Banana Split and Chocolate flavors. 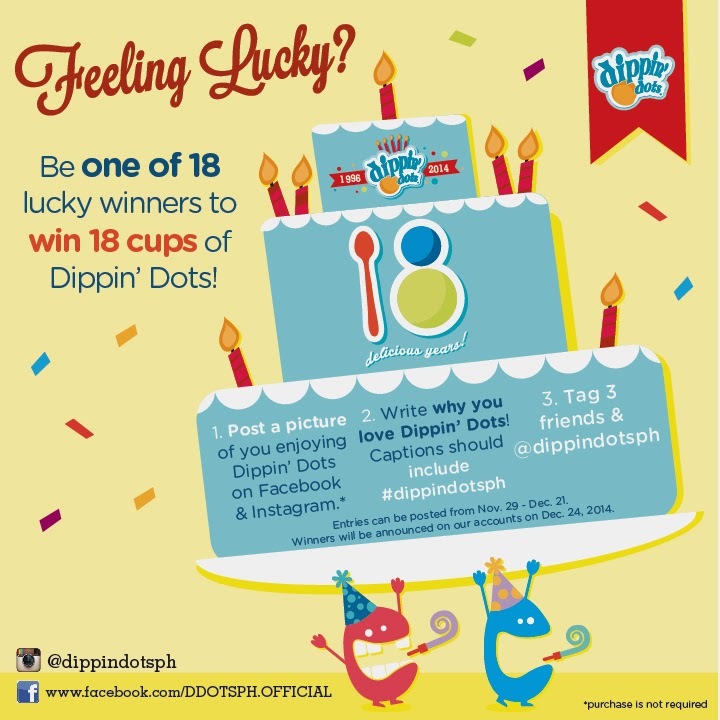 Aside from the 1996 anniversary price rollback on December 7, 2014, Dippin' Dots invites you to join an exciting giveaway wherein you can be one of eighteen lucky winners of 18 cups of Dippin' Dots! Giveaway ends on December 21, 2014. Winners will be announced on December 24, 2014 at Dippin' Dots accounts. Dippin' Dots branches are located at 1/F Activity Center, Fairview Terraces, 3/F CitiWalk 2 Bldg. B, Eastwood, 2/F V-Mall Greenhills, Ashcreek Ccenter, 1/F & 5/F Shangri-La, 3/F The Podium, G/F Frontera Verde (Tiendesitas), 4/F Market Market, 2/F Glorietta 2, 2/F Glorietta 3, 2/F Main Mall, Mall Of Asia, 2/F Alabang Town Center, Shell SLEX Northbound (near Mamplasan Exit).